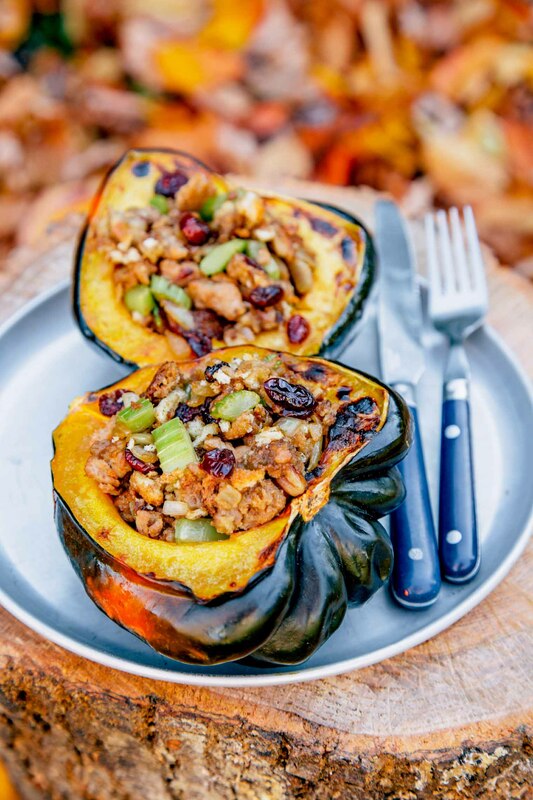 Combining all the classic Thanksgiving flavors into an edible bowl, this roasted stuffed squash is the perfect no-mess camping meal for Thanksgiving. But what if we could distill all of the Thanksgiving flavors into a something more manageable? Introducing: Thanksgiving in a Bowl. We started by roasting acorn squash halves on a grill over the open fire. While the squash cooked, we made a turkey sausage stuffing in a cast iron skillet with onions, celery, crumbled sausage, and stale bread. 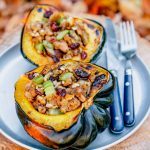 When the squash was ready, we filled the middles with a heaping serving of the stuffing and topped the whole thing with dried cranberries and pecans. And just like that, we had the essence of Thanksgiving, in a camp-friendly bowl. When you’re cooking at a campsite, this is one of the easiest ways to get that big Thanksgiving flavor without doing all that big Thanksgiving prep-work. Perfect – now you might be able to fit dessert in too! ‣ If you’re catering to a large group, this meal is very scalable without much additional work. Just add some more squash to the grill and make a double serving of the stuffing. 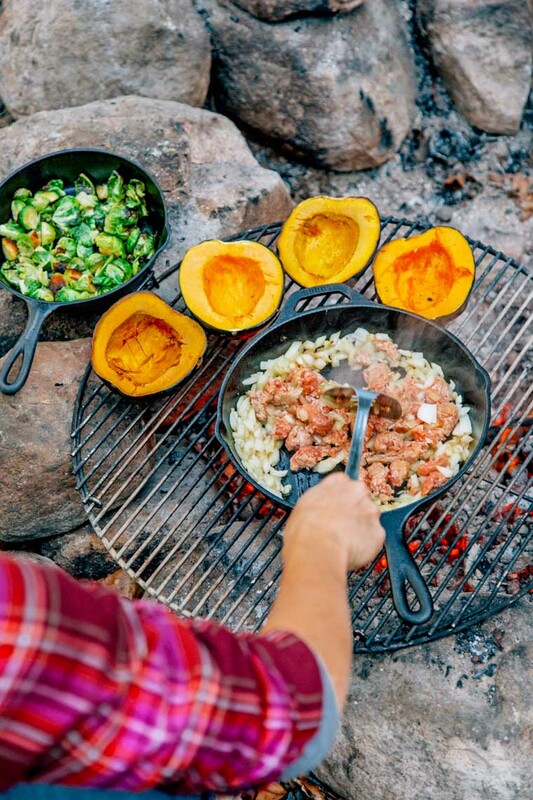 ‣ As far as vegetables go, they don’t get more durable than acorn squash, which is great news when you’re camping. We’re pretty sure you could drive up a winding mountain road with them in the back of a pick up and they’d be fine. ‣ If you’ve read our guide about Thanksgiving Camping, you already know our opinion about cooking a whole turkey. It’s barely worth all the effort at home, but at a campsite, it’s just crazy. This recipe allows you get the turkey flavor while allowing you to put your efforts towards what really matters: the sides! ‣ If you’re cooking over charcoals, it may not be necessary to use aluminum foil to wrap the acorn squash. But if you’re cooking over wood, we’d suggest it. Wood is a bit more smokey and it can discolor the squash, or leave you with charred skin which can flake off onto your plate and into your food. ‣ The biggest mistake you can make when cooking Thanksgiving at a campground is to not start cooking soon enough. The sun goes down early in late November, and the evenings can get really cold, so do yourself a favor and starting cooking early. 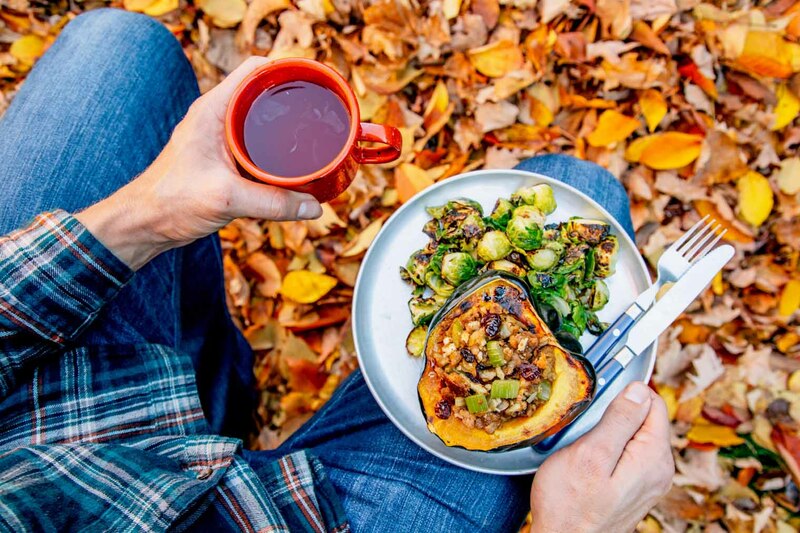 You can read our other tips for celebrating Thanksgiving while camping here. ‣ We used crumbled turkey sausage because it comes pre-seasoned, but you could also use ground turkey. Just make sure add a little salt and pepper. ‣ Vegetarian or vegan? You can swap out the turkey with tempeh. We have a good marinade here that you can use to give it some flavor. ‣ If you’re the type of person who enjoys homemade stuffing, then we’ve got a recipe for you. But if you’re looking to keep things simple, there is absolutely no shame in using store bought stuffing. That’s what we did for this one. 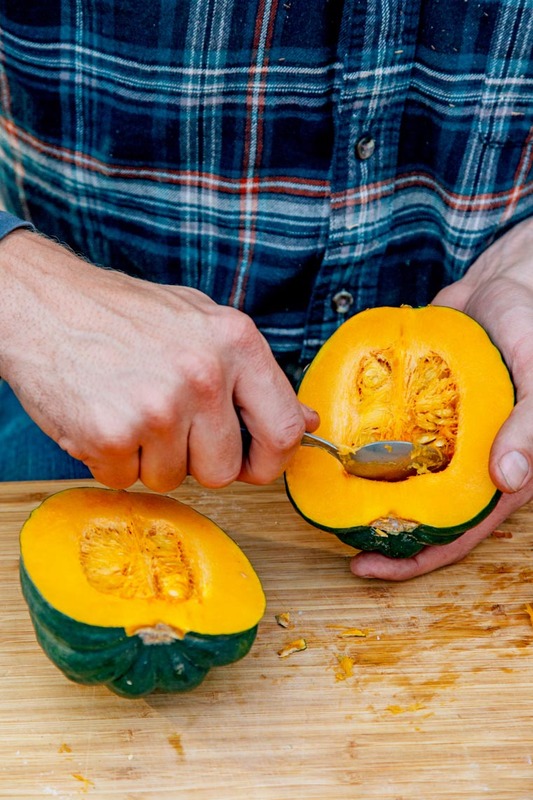 PREPARE THE SQUASH: Using a large knife, chop the squash in half pole-to-pole. Scoop the seeds and stringy pulp out of the center with a spoon and discard. Rub the cut sides of each squash half with a teaspoon of olive oil and season with the salt. Wrap in heavy duty aluminum foil (optional, but recommended if cooking over a wood fire). ROAST THE SQUASH: Place the squash on the grill, cut side up, over medium heat. Roast for 30 minutes, then flip the squash so the cut side is facing down, and roast for an additional 15 minutes or until the squash is tender. PREPARE THE STUFFING: Heat oil in a skillet over medium heat. Add the diced onions and saute until they are just beginning to soften, about 3 minutes. Add the turkey and cook until beginning to brown, 5 minutes or so, breaking it apart with your spatula as it cooks. Add the celery and cook for 2 minutes more. Fold the prepared stuffing into the turkey and vegetable mixture (or, if using store bought stuffing, add the mix and liquid to the pan), pecans, and cranberries. ASSEMBLE: Carefully unwrap the squash from the foil. Scoop half of the stuffing mixture into the cavity of each squash half. Roast the squash, unwrapped, cut-side up on a baking sheet at 400 degrees for about 45 minutes, until just tender. Prepare the stuffing as directed. 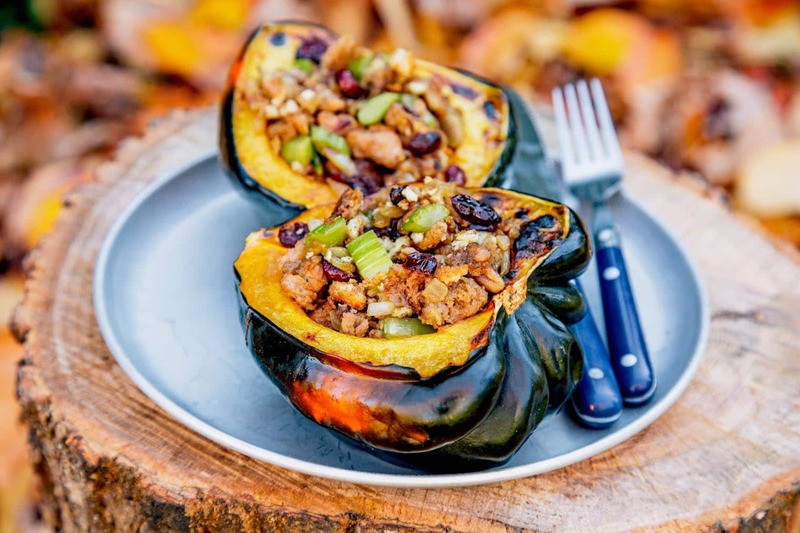 Assemble and wrap each stuffed squash half in foil. Once you get to camp, place the wrapped squash on the campfire and heat until warmed through.